Canoeing the River Tees is not something I did when I was younger. Even though I grew up in the north east of England and the Tees was local to where I lived until I was 18 years old, it was only later in my life I began paddling. I know sections of the Tees very well from the bank, having walked and cycled extensively in Teesdale. When I was in Scouts we built rafts and floated them on a section of the river near Barnard Castle. The summer after my A-levels we floated down a section below Cotherstone in an inflatable dinghy. These days when I revisit the area, I like to try to canoe on the river if I can. Recently I was able to spend a couple of days paddling on the Tees. The first day I paddled tandem with Amanda from Cotherstone to Barnard Castle, a run I have done multiple times before but the water levels are always different so there is no lack of variety. It’s also a very picturesque section of river. About a week later I went out solo with some friends from the north east. We paddled the section below Barnard Castle, from just past Abbey bridge to be precise, down to Winston. While I was familiar with many of the features along the river – such as the rock steps at Whorlton Lido, I had never paddled this section of river. Water levels were again low but it was nonetheless a fun day out with a variety of features to make the most of and several obstacles to negotiate. There are some unusual “fun slide” features on this section of river too. All this, combined with lovely tree-lined river banks and spring sunshine made for a very fulfilling day on the river. These videos form the first two of a series of video blogs, or vlogs, probably irregular but aimed to share some of my fun or otherwise interesting times outdoors around the UK and further afield. These will be published on my YouTube channel (please subscribe here) as well as embedded here. Please leave a comment below to let me know if you enjoyed this format, if you found value in the contents of the videos and if you’d like to see more of this type of video blog/video diary style of video… As always I’ll read every comment and reply to as many as I can. Thank you for sharing these beautiful scenery’s/video’s. I wish I could be there. I’m not a canoe person although I have done some in the past. out and doing for my self and if I felt up to it, go for it, so I will. Way to go Jeff!! I’m 53 so there’s hope for me yet!! Nice to see you out paddling in that neck of the woods … haven’t seen the area since I was at school there next to Bowes museum. It really is a great part of the world. Not sure what Mr Goodwin would say about the swims though 🙂 I thought you were unlucky, especially with the first one which I thought you run through. Low brace gets you there every time. I know I’m biased as a paddler but I think it is hard to underestimate what connection to the surroundings can be made during a canoe trip and also how wildlife around don’t seem to be unduly bothered by canoes. Yes, it’s a lovely river. Cold wet instant and still kept the go pro dry well done and love the music, it is not so grim up north after all. Hi Paul, thanks for taking us along. Love the video. Thanks for giving the locations. Being a map guy, I went to google maps/earth and explored the whole area. Makes me want to take a walk down Abbey lane, check out the castle, then head into Barnard for a pint. No places like that here in Dayton, Ohio. Love the UK. Keep up the good work, thanks. Marcos D.
I’m glad I spurred you on a virtual trip. Barnard Castle is a good place to have a pint 🙂 There are a fair few pubs there. The castle dates back to not long after the Norman conquest and was developed in the 12th Century by Bernard de Balliol, after which it is named. Excellent Video’s really enjoyed the content. thanks again for sharing all this great content for free. 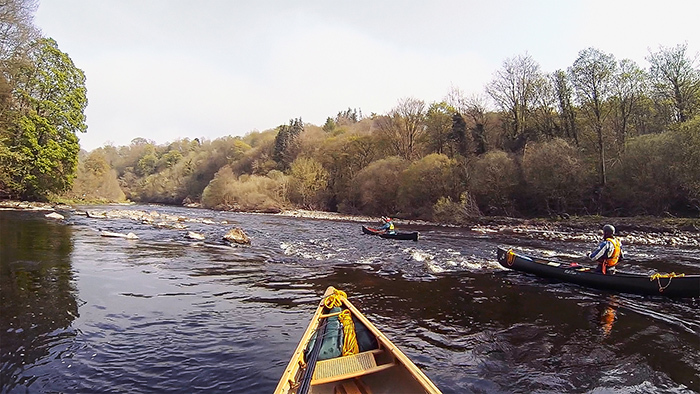 I really like your paddling videos, they have given me an insight into what to expect on the Spey and the Tees. Your trip from Bernard castle is a grade 3 run according to a recent canoe focus, I can see where the roller coaster rides are but there is nothing like seeing the action for yourself. I think a visit to the Tees is called for after a good rainy spell, ‘note to self, take the camera with charged batteries’. I shall be doing some video trips on the Trent and Tame in the summer, both normally grade 1, easy steady paddling but when there is rain on the Staffordshire moorlands grade 2 but flat. I’m glad my vids have provided some insight. The section below Barnard Castle drops a grade in low water. We started after Abbey gorge and this in particular is the section to be mindful of in an open boat when the water is running but a favourite of kayakers. My pleasure Peter. I’m glad you enjoyed. I enjoyed your new ‘vlogs’ very much! It really feels like being out there a bit. I particularly like being in a position to observe what kind of line you choose when navigating your way down the ‘bony’ river. What a beautiful River Tees is. Thanks for being there sharing your part of the world experience. Paul thanks for everything you do on social media a question, what is the brand and size of the waterproof pack you use in this video thanks. It’s a little big as a day pack but in terms of adding extra leadership items such as a first aid kit and group shelter, it provides plenty of room. I find it big enough for year-round use, having enough room for a vacuum flask and other extra items in winter. I also have the 115 litre which I use on multi-day trips. Both are very tough and reliable. Highly recommended!